We all know of the giant calendars sitting under our desktop computers at the office, and it’s likely that since the day they were placed there, they’ve been used as doodle boards, sticky note storage, signature practice space and, of course, placemats for our frozen lunches and coasters for our water-ringed coffee mugs. Whatever our favorite unintended use of our desktop calendars, we rarely use them for their intended purpose of keeping track of important meetings, deadlines, birthdays and office soirees. With email calendars, blackberries and iPhones, they’ve become nearly obsolete. But now, with the addition of email calendars and handheld technology, we’ve lost the vibrant, creatively-themed monthly images we used to look forward to discovering on the first day of every month. Not all of us have walls around our desks to hang calendars, and let’s face it, trying to squeeze an image into our phone calendars would work as well as trying to squeeze another meeting into our Monday agendas. All those cd cases you’ve been meaning to find a use for since you started using mp3 devices? They now have a purpose! That something special you’ve needed to fill a lumpy package to get your customers’ attention in the mail? You’ve got it! CD case calendars are a seemingly simple idea, but they’ve got more marketing and creative juice than you think! 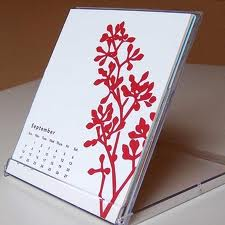 Just take a look at these 10 creative uses for jewel case calendars, and you’ll see the potential we’re talking about. 1. Company history highlights: Feature a unique and significant event in your company’s history every month. 2. Product spotlights: Provide insight, product details and helpful how-to’s on selected products and services. 3. Sales and specials: Highlight all your awesome monthly deals on select items, services, packages or consultations. They might even coincide with current product spotlights! 4. Internal communication: Highlight and provide details on internal company events, milestones, deadlines and goals throughout the year. 5. Client success stories: A perfect opportunity to communicate your previous success to potential customers. 6. Personal photos: Have each employee upload personal photos - appropriate for work and carefully selected, of course - to warm their desks all year long. 8. Personalized employee history: Highlight your employees’ professional achievements and development throughout their tenure with your company. 9. Company- or department-wide monthly focuses: Remind your employees of each month’s goal or focus to keep everyone on the same page. These, among many others, are great ways to add a little creativity to your communications with employees and customers. Don’t be afraid to use humor or personal anecdotes; they’ll make the calendars truly unique and something your recipients will be happy to hang on to.